Chez André du Sacré Coeur is a typical Parisian café where you can enjoy traditional homemade dishes. 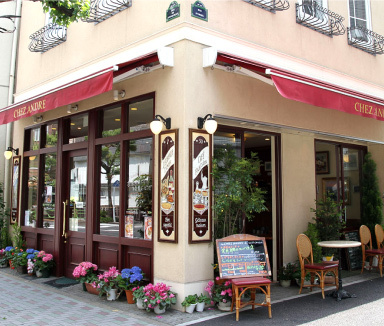 You will find yourself in a relaxed and informal atmosphere and feel a little bit of Paris in the center of Tokyo. We are open all day so feel free to come in just for a coffee or a quick lunch. We also serve dinner featuring classic French dishes such as mussels, quiche, duck confit and so much more. Mr. Hajime Anzai will perform at our cafe on April 11th and 17th, 2018.. There is of course no additional charge for the music ! Please come have dinner and enjoy the musette as if you were in Montmartre. Time flies…. 10 years already!, We are so grateful to all our customers for their support over the years. On April 17th, we will prepare the traditional roast chicken for the plat du jour! Please come!